My thoughts: Riley. Beck. Where do I begin? I first started reading this book last year but put it to the side to deal with book tour commitments. When I tired of some of the typical romance I see so prevalent in today's YA paranormal stories, I reached for this book again. That was the best move I made in a long time. I devoured this book in one evening, not wanting to leave the world Jana Oliver so vividly brought to life on the pages. A futuristic Atlanta. Demons on the loose. A Guild of Trappers whose purpose is to eradicate the horrible creatures. A father raising his teenage daughter on his own. A family friend intent on protecting the young girl he may or may not have feelings for. Riley Blackthorne. Vulnerable. Strong. Stubborn. Loving. She's wonderfully flawed, fiercely independent and such a kickass teen, she instantly made my Top 10 list of Admirable YA Heroines, right alongside Katniss, Rose, Juliette, and Clary. From Riley's first encounter with a loose demon in a library, I was hooked by this fun, mesmerizing adventure. Told in third person, the author depicts a beguiling futuristic America where kids attend school in abandoned storefronts and supermarkets, merchants sell their wares in tents lined along a park, and angels are said to walk among mankind. There was so much to like and admire in this book. The newly dead can be reanimated? Check. Demons come in five grade levels? Yep, check. There is a war brewing between heaven and hell? A definite check. The idea of a Demon Trappers Guild was unique and drew me further into the story. And then there's the hot dude in black named Ori who may or may not be a freelance hunter or angel. As much as I loved Riley, Beck grew on me until he pushed Riley aside to make room for himself as two of my favorite characters--I loved them both! Beck is an amazingly complex young man. Hidden behind his good ole' boy Georgia twang beats the heart of a fierce mysterious man. There is so much more to learn about him than what we see in this first installment. The rapport between these two shows years of knowing each other and Riley's youthful crush on Beck only adds to the simmering sizzle between these two. I really liked Jana Oliver's writing. Her style was crisp and straight on, she chose the right words for every scene and her dialogue sounded realistic and emotional. Talk about yanking on the heart strings, I teared up at the funeral scene when Riley says goodbye to her dad. Both main and secondary characters were well written, the story lines were layered and intrigued my paranormal-loving mind. The romance between Riley and Simon was slow and sweet. The ending caught me completely off guard. 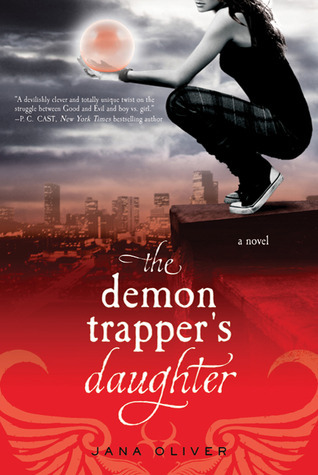 I had to run out and get the next two books in this series after finishing The Demon Trapper's Daughter, that's how incredibly hooked on this series I've become. Rating: 4 stars. I said I liked this book, didn't I? Favorite excerpt: There were a bunch but I didn't want to share the longer sections so I settled on this one. "His gaze weighed on her, and she found it hard to think. "When you find the Five," she said breathlessly, "I want to be there. I want to help you take it down." Ori smiled at her, and for a second she thought he'd agree. "No. It's best you stay out of harm's way." Riley's excitement deflated. "You sound like Beck." "That's Denver Beck, isn't it? Paul mentioned him. What's he like?" Ori asked. "Oh, where do I start? Beck's mouthy and he lives to tell me what to do." In short, he's so not you. "Why do you want to know?" A glimmer appeared in Ori's dark eyes. "Just scoping out the competition."" Cover comment: I'm so glad they have a model and backdrop that totally relates to the main character and story. Yes! Book source: Received an ARC from the publisher for my honest review. I liked this book too! I love reading of strong characters and I'm looking forward to reading the next books in the series. Great review!